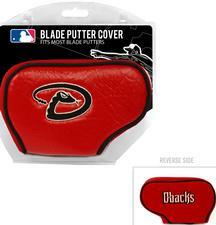 MLB Blade Putter Cover (Select Teams Available) - $13.95 - GolfersEdgeOnline.com - Best Golf Equipment On The Web! Proudly support your favorite baseball team during an 18-hole game with the Team Golf® Arizona Diamondbacks Blade Putter Cover. This cover features the team colors with embroidered team graphics for extra team spirit. The buffalo vinyl and synthetic suede keep your blade putter clean while the fleece lining provides extra protection. Designed for virtually all blade putters, this cover is the perfect addition to your golf accessories. If you have any more questions about the MLB Blade Putter Cover (Select Teams Available); do not see the model you are looking for; need custom options; or prefer to not purchase online, then please call us at (630) 656-1291.